– 2,500 – 2,800 sq. 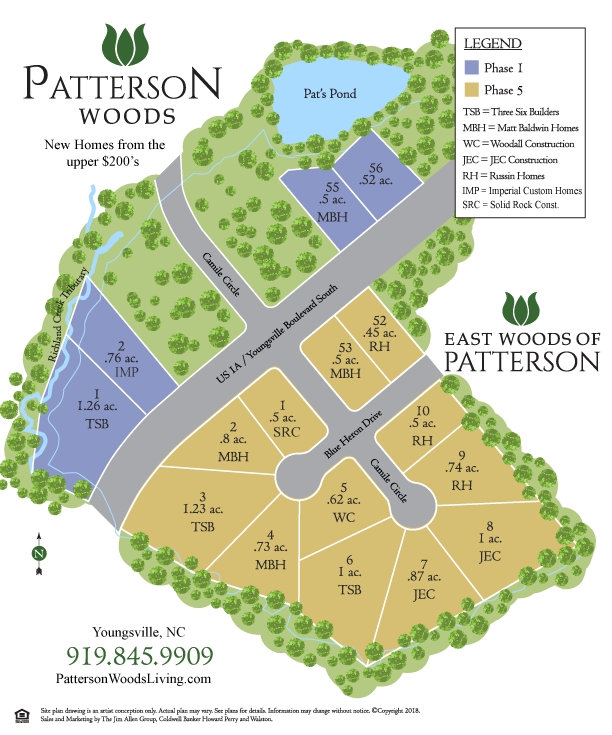 ft.
Patterson Woods offers new homes in an established community in Youngsville. Homeowners enjoy easy access to Highway 98, US-1 and I-540 which makes commuting to Raleigh, Durham, RTP and the RDU Airport a breeze. Convenient nearby shopping experience plus all the great dining and unique shopping minute away. Opportunities are limited so don’t miss, quality craftsmanship of new homes with 1st-floor master and ranch home plans available. Homes start in the upper-$200’s with from 2,000 to 2,500 square feet. This neighborhood has all the benefits your family desires with incredible features in downtown Youngsville. Choose your homesite to get started today! Drive North on US 1/Capital Blvd through Wake Forest. Turn right on Harris Road, then turn Left on N. Main Street. Patterson Woods will be ahead on your left.